Handmade in Japan the Wood Stone Traditional Jazz Tenor Sax mouthpiece is made to the highest standards. Based on the classic Otto Link ebonite vintage pieces this Wood Stone 'Traditional Jazz' mouthpiece from Ishimori offers players a lively yet warm and tubby sound. With a very immediate response due to the impeccably produced tip rails and facing curve the Wood Stone offers a wonderful level of flexibility and evenness of tone that very much lives up to the price tag. We've been massively impressed with all the Wood Stone product (ligatures, reeds and now mouthpieces). The production quality and hand finishing is arguably the most impressive we've ever seen on a mouthpiece and this results in a really exciting mouthpiece to play. 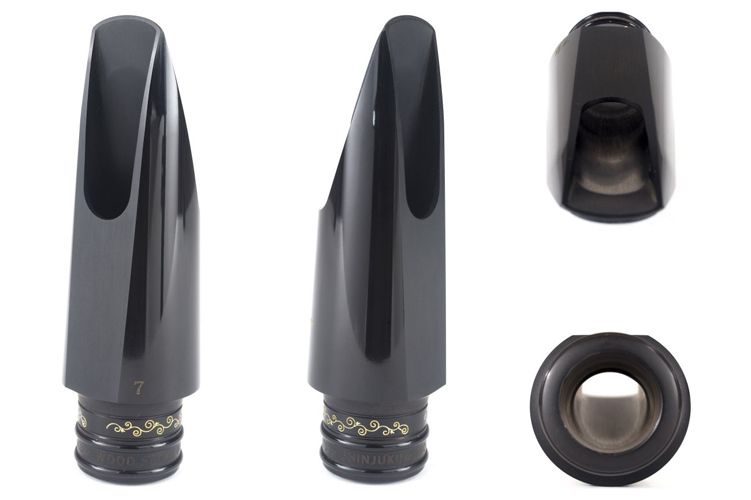 Professional hand finished ebonite Tenor mouthpiece. Meticulously finished by experts in Japan. Large chamber for full, rich tone. Excellent for all genres of Jazz both traditional and contemporary. Mouthpiece only, not supplied with ligature or cap. The Ishimori Woodstone hard rubber tenor sax mouthpiece is an excellent choice for anyone trying to get the classic Blue Note jazz tenor sound. It is dark and rich sounding and easy to play. It has a great Hank Mobley vibe!